“Does this smell like a different springtime flower to you?” asked Eric La Fountaine yesterday afternoon. “Yes, it most certainly does…”, but as is often the case with floral scents, they can be hard to immediately place. Eric then suggested, “Lilac?”. Yes, almost a perfect match for that well-known fragrance. Although I was looking forward to this year’s blooming of magnolias in the Garden, the reality of the late winter / springtime weather has somewhat dampened the experience. Frosty, snowy weather in February damaged the flower buds of several plants, so annual favourites like Magnolia campbellii ‘Borde Hill’ have no flowers this year (“fun” fact–the aborted, rotting flower buds of this magnolia smell like eggplant parmesan, also as determined by Eric). And, now that the magnolias (and ornamental cherries for that matter) are soon to peak, the forecast is for rain. It’s not sympathetic to many other parts of the world to complain about the precipitation, but I do prefer photographing magnolias with either blue skies or golden evening light. Yulan magnolia or lily tree has been cultivated for its beauty since at least 618 AD, when records indicate it was grown in Chinese Buddhist temple gardens. 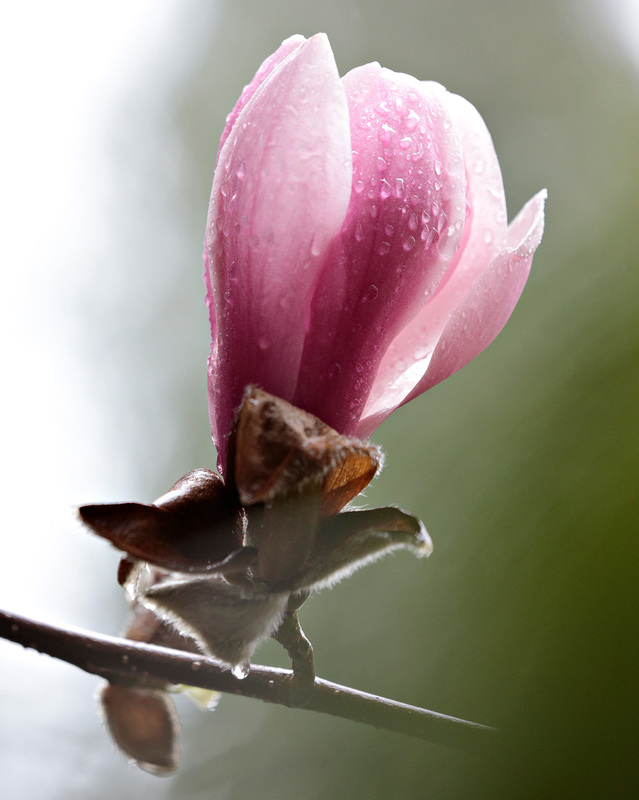 This makes it the longest-known magnolia species in cultivation. The cultivar ‘Forrest’s Pink’ was selected for its mostly pink tepals; the species has soft, creamy white ones. 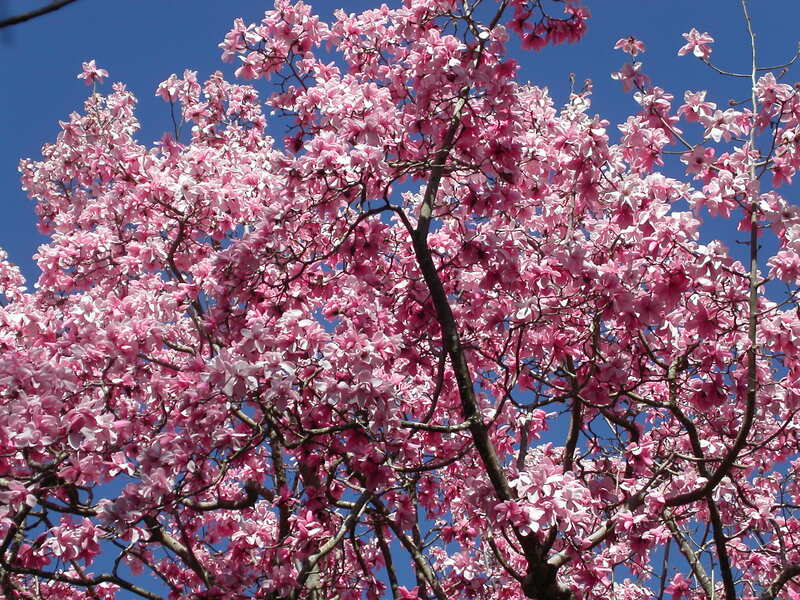 The Missouri Botanical Garden also has a factsheet on the species, Magnolia denudata . It includes an explanation of the specific epithet: “[denudata] means bare or naked as the tree flowers before the leaves emerge”. Flowering before leaf emergence is actually a phenomenon associated with many of the deciduous magnolia species. spreading to accept the early sun. Beautiful photo, Daniel. One can almost smell the fragrance. Thanks for this – love the references to fragrance as it makes it all the more real. Here in Maine we’re hoping tonight’s storm will be rain (not snow, ice, etc. ), as it will help melt the snow. My M. stellata’s buds are still closed tight. Thanks for bringing spring to us! Great post, really giving an experience one can’t often garner from a photo blog, thank you. What a lovely picture. Caerhays in Cornwall UK claims to have raised Forrest’s Pink from his seed. Raised in Sussex Magnolia campbellii ‘Borde Hill’ and Magnolia mollicomata ‘Lanarth’ raised in Cornwall are similar in colour. It would be interesting to know if the seeds were collected by Forrest in the same area and received in the same year. I’m not far from Borde Hill and magnolia flowers here had late frost this year. You are right about blue sky Daniel. Caerhays in Cornwall holds the UK National Magnolia Collection in the UK. In a good year this is what Magnolia sargentiana ‘Delia Williams’ can do. Lifts the spirits I think you will agree. Yes, definitely. Although I have taken photos in poorer weather and been happy with them, there is something special about those blooms against the blue sky.